Quick overview Numerous designers have pioneered cutting-edge garments and collections throughout the evolution of fashion. But all too often a lack of obvious fit or purpose has been mistaken for a lack of design sophistication. This title champions the improbable, the provocative, the uncomfortable and the seemingly ridiculous. Numerous designers have pioneered cutting-edge garments and collections throughout the evolution of fashion. But all too often a lack of obvious fit or purpose has been mistaken for a lack of design sophistication. In an informed defence of innovative fashion, Why You Can Go Out Dressed Like That champions the improbable, the provocative, the uncomfortable and the seemingly ridiculous. Inspired by diverse sources, theories and concepts, as well as futuristic textiles and techniques, the book explores the groundbreaking work of designers who strive to extend the boundaries of their creativity. There are no fixed elements to the 100 designs featured in this book, which range from the cerebral conceptions of Comme des Garcons, to the augmented anatomies of Thierry Mugler and the exaggerated physicality of Thom Brownes broad-shouldered men. The garments do not have to fulfil a function, keep you warm, or increase sexual attraction, nor do they have to beguile or disarm. They do need to have impact at the time of creation and to prove influential in the longer term. 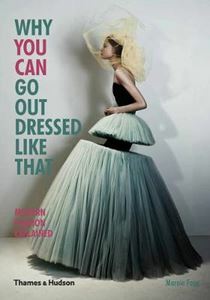 Many original designs elicit the response: You cant go out dressed like that! Marnie Fogg proves decisively that modern fashion is not as outrageous and unwearable as it may seem.